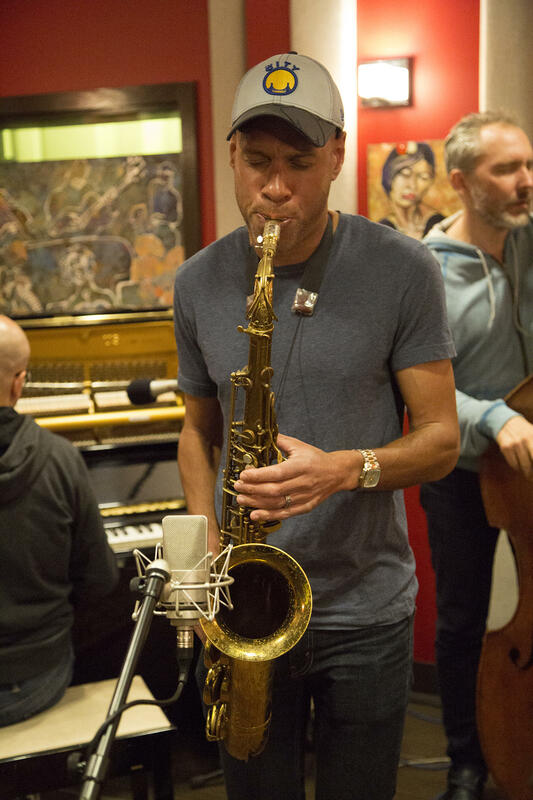 Joshua Redman in the KPLU studio during a live studio session. The Bad Plus Joshua Redman live in the KPLU studios for a studio session. David King in the KPLU studio for a live studio session. 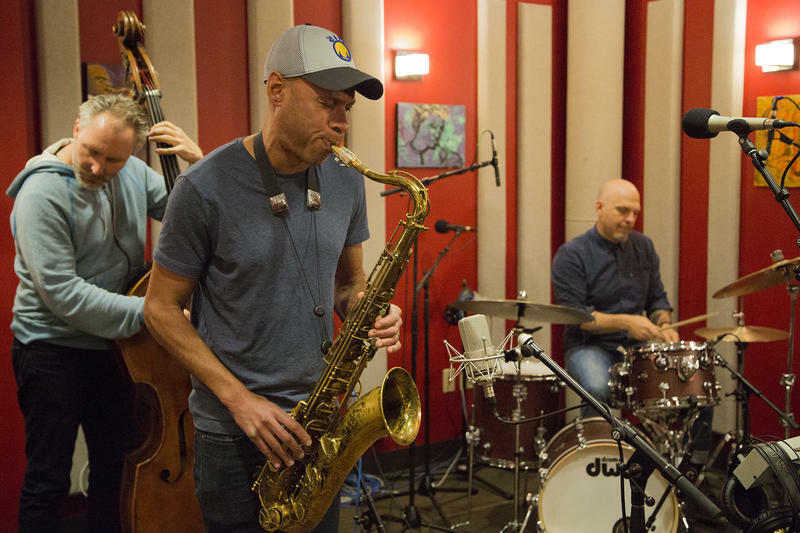 Reid Anderson, Joshua Redman, and David King in the KPLU studios for a live studio session. 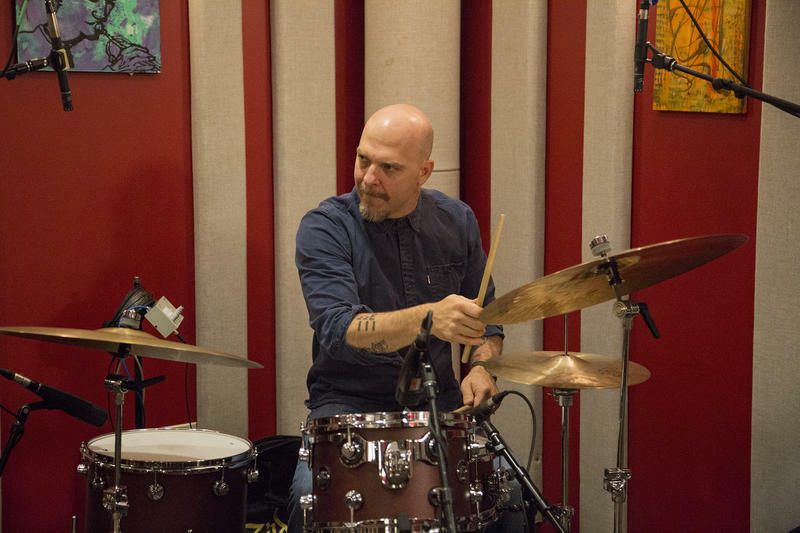 The Bad Plus is one of the most in-demand trios in jazz. 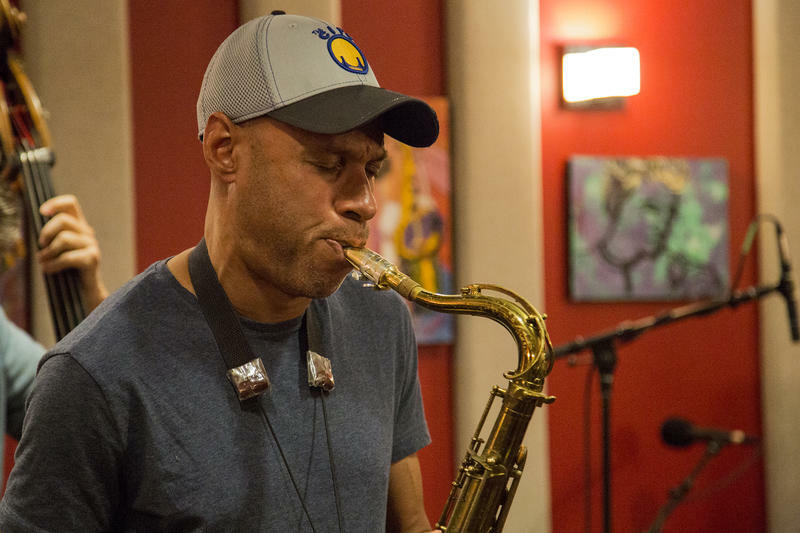 Joshua Redman is one of the most in-demand saxophonists. 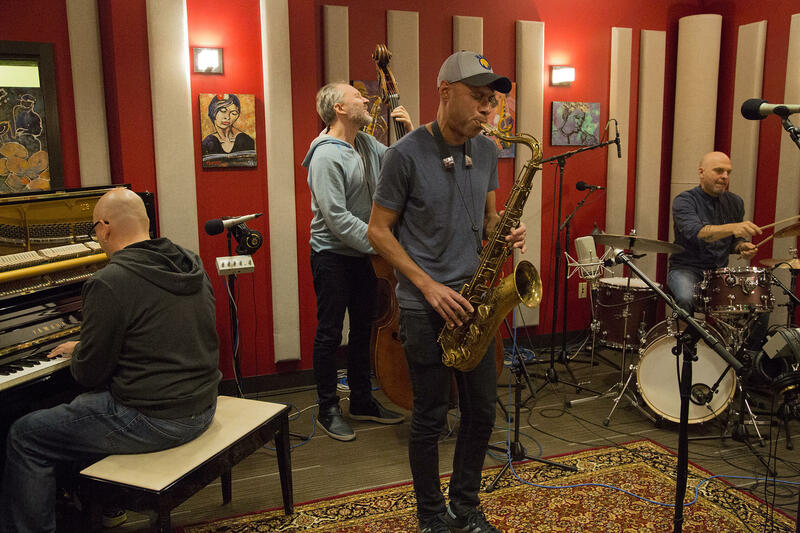 When the trio and the saxophonist joined forces to become The Bad Plus Joshua Redman, the star-power threatened to be blinding, so when they came to KPLU for a live session, we all had sunglasses near at hand. As it turns out, we didn’t need them. Yes, they are a stunning quartet but they are also humble, thoughtful and humorous about the wonderful music they make. They’re also incredibly excited about it. In this performance interview with Abe Beeson, they play two adventurous songs from their first release as a group. Between numbers, the group talks about how this current team-up came about and what they hope its future will be. 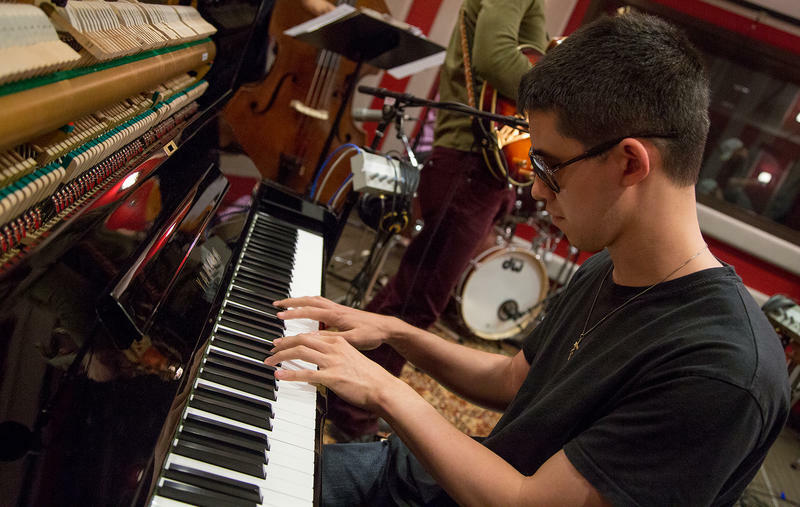 The first time we met pianist Justin Kauflin he was in Seattle as part of the Seattle International Film Festival, which was showing a documentary about the friendship between the young Justin and veteran jazz trumpeter Clark Terry. The movie is called Keep On Keepin’ On and if you haven’t seen it, you’re missing a lovely story. Mr. Terry has since passed on but Justin is still very much with us (he’s only 29, after all) and growing by leaps and bounds as a musician. 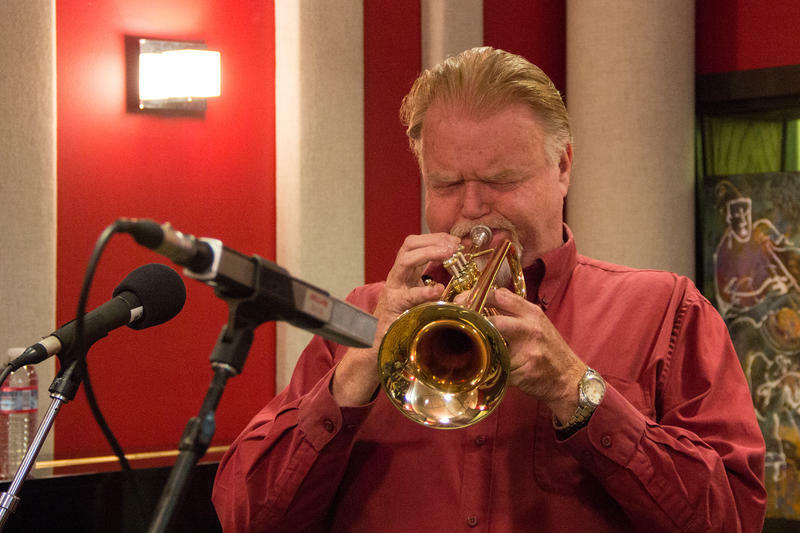 When trumpeter Lance Buller takes the stage, the audience knows it’s in for a good time. He’s serious about his music but he’s also serious about making sure his listeners have fun. Put another way: he’s a terrific jazz trumpeter but he’s also an entertainer. Lance’s latest show is a tribute to his 3 greatest influences. It’s called The 3 Louis—Louis Armstrong, Louis Jordan & Louis Prima. 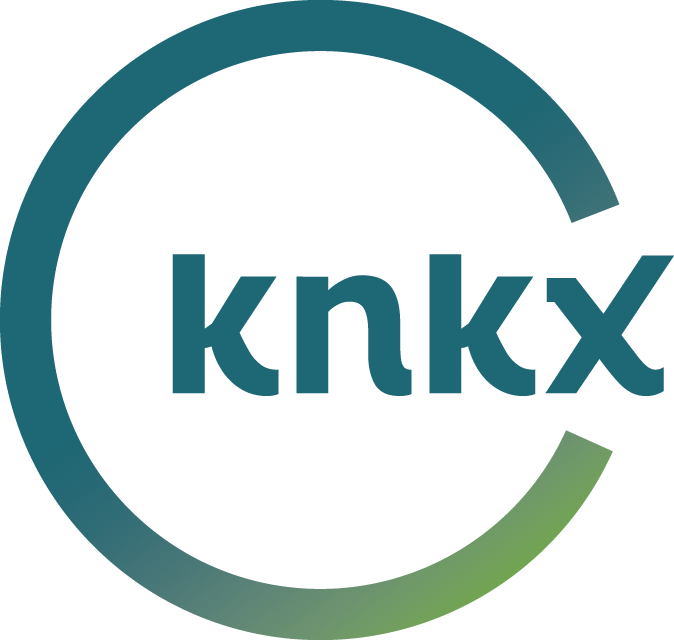 We invited Lance and The Roadstars into the KPLU performance studio to give us a preview of the new show. As we expected, good times ensued. Enjoy! 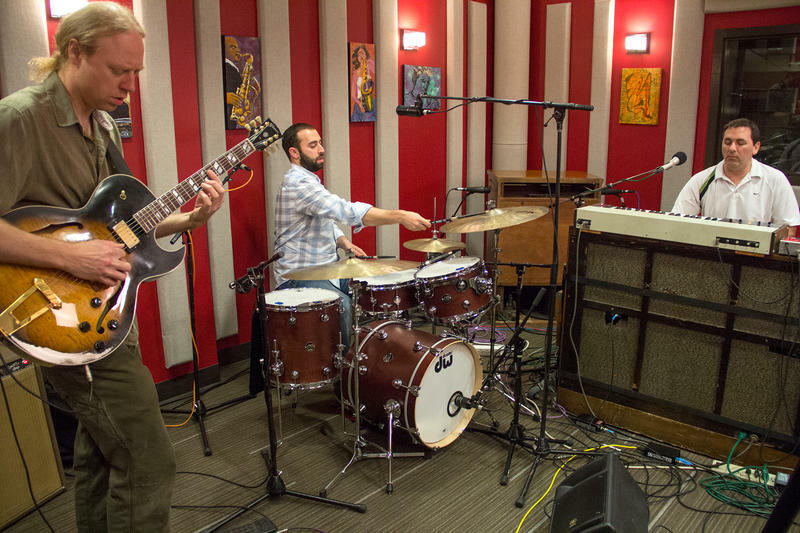 McTuff is a Seattle organ trio consisting of Joe Doria (Hammond B-3 organ), Andy Coe (guitar) and Tarik Abouzeid (drums). The band breaks through the constraints of genre expectations and reaches a wide range of music lovers. They can play for an audience of jazz purists who just want to listen to the music or they can play for an audience of people who just want to dance. And they do that by being exactly who they are: three inventive musicians who don’t mind bringin’ on the funk.